In the first part of the 20th century the Sunbeam marque was one of the most famous in the world. This was due not only to the fine quality of the cars which the company offered for sale but also to Sunbeam’s exploits in the field of motor racing and the world land speed records which it achieved. Sunbeam produced many excellent drivers but the most famous of all was Sir Henry Segrave who not only won the French Grand Prix in 1923 but also set several world speed records during the 1920s. 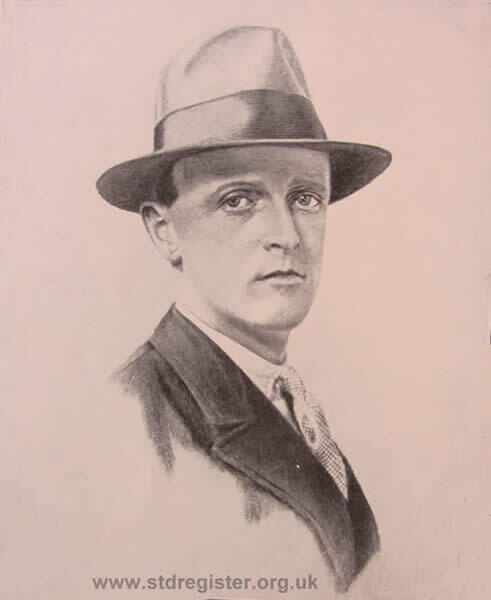 K. Lee Guinness (who designed the innovative KLG spark plugs) first claimed the world land speed record for Sunbeam on 17th May 1922 at the Brooklands race track in Surrey. Driving a 350hp 12 cylinder Sunbeam car he recorded the world record speed of 129.17 mph over one mile and also recorded 133.75mph over one kilometre. The car was then sold to Malcolm Campbell who named it Bluebird and on 25th September 1924, at Pendine Sands in South Wales, he broke the world record and achieved a mean speed of 146.16 mph made both ways over a one kilometre course. This car had a very large Sunbeam Manitou aero engine of 18 litres or 18322cc capacity. The following year, in the same car and at the same place, he increased the record on 21st July 1925 to 150.87 mph over a kilometre and 150.76mph over a measured mile. Maj. Segrave had already achieved fame after he took 1st place in the 1923 French Grand Prix. In this famous race Sunbeams, driven by A. Divo and K. Lee Guinness, also took 2nd and 4th places in competition with Bugattis and Fiats among others. He was the first and only Briton to win a Grand Prix in the first half of the 20th century. He also won the Spanish Grand Prix the following year; again on a Sunbeam. On 16th March 1926 Henry Segrave beat Campell’s world speed record on another Sunbeam. This was the first appearance of a new 12 cylinder car with an engine size of only 4 litres (3976cc). This was the Sunbeam Tiger which he called Ladybird. 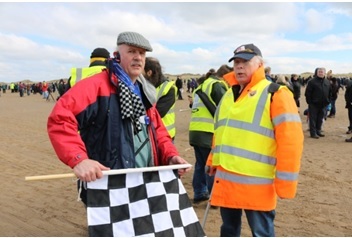 Driving at Southport Sands he achieved 152.336 mph over a kilometre course – the first time 150mph had been exceeded. It is the 90th anniversary of this run which was celebrated recently at the same location. (see below). 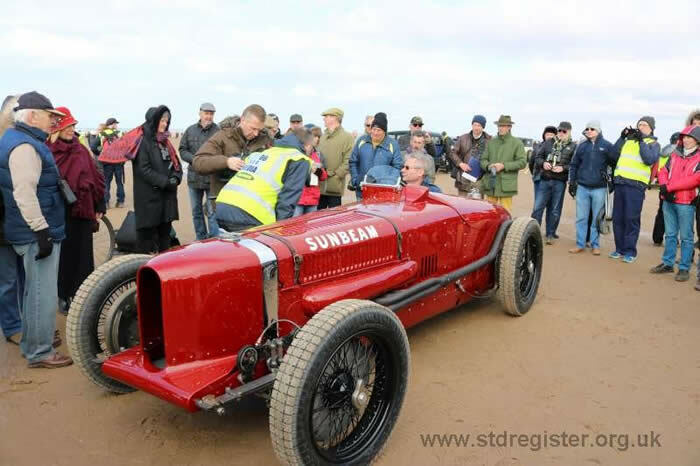 After this, the record was broken twice by two other makes of car but on 29th March 1927 came the final triumph for Segrave and Sunbeam when a 1000hp Sunbeam car reclaimed the record and became the first to exceed 200mph. The car featured two Sunbeam Matabele aero engines and, driving at Daytona Beach in Florida, Segrave achieved a mean speed of 203.793 over a mile course. In those days, when ordinary touring cars were driven typically at about 40 mph, this was an outstanding achievement. Segrave subsequently regained the world land speed record for a third time in 1929 at 231.446 mph, on this occasion driving a Napier engined car, the Golden Arrow, also at Daytona Beach and after this further success he received his knighthood. On Friday 13th June 1930 Segrave set a world water speed record in his boat Miss England II when he reached a speed of 98.76 mph over two runs on Lake Windermere. On attempting a third run his boat hit a log and capsized at speed. He died of his injuries shortly after being informed of his new record. Spend a few minutes to watch this excellent short video produced by Paul Tarsey of Historic Racing News. 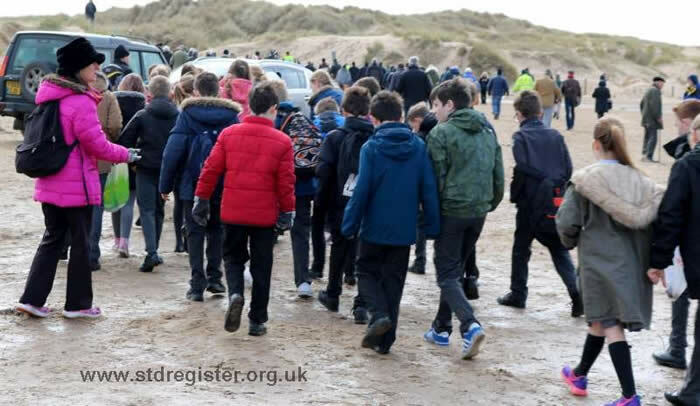 The pupils of nearby Shoreside Primary School attended the event as part of their studies into local history. 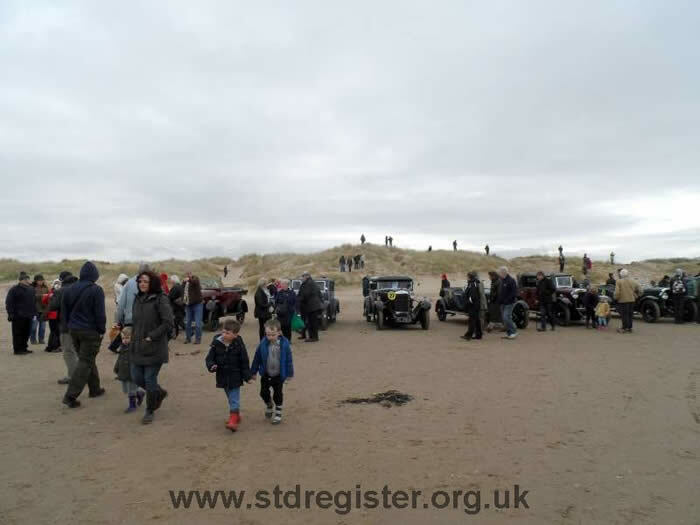 A selection of 1920s touring cars parked on the beach. From the left: Chrysler, Sunbeam 3 litre Super Sports, Sunbeam 16 saloon and Sunbeam open tourer. The fastest of these being the 3 litre twin cam Sunbeam which could reach 90 mph! 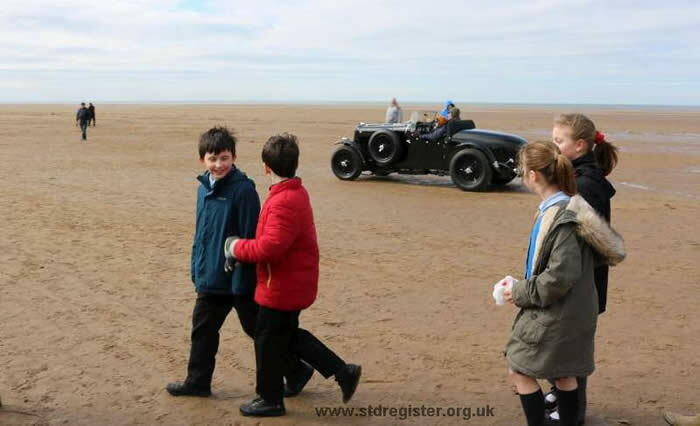 A Talbot passing some Shoreside Primary School pupils on their way to watch the fun. The “measured mile” as used in 1926 for the record breaking run. The Sunbeam Tiger returning after 90 years to the scene of its great success in 1926. Maj. Henry Segrave at Southport Beach in 1926.